Goose Creek fire. McCall Camp S-223 CCC's on fire. Nezperce National Forest, Idaho. Blister rust crew building fire line on Pack River Fire. South Carolina. Fire fighting crew [handwritten note: "of conscientious objectors"] attacks head fire with half ton pumper truck in hand tools. Water from truck applied by hosemen to base of flame, cools down fire only enough so that men following with flaps can handle it. CPS Unit No. 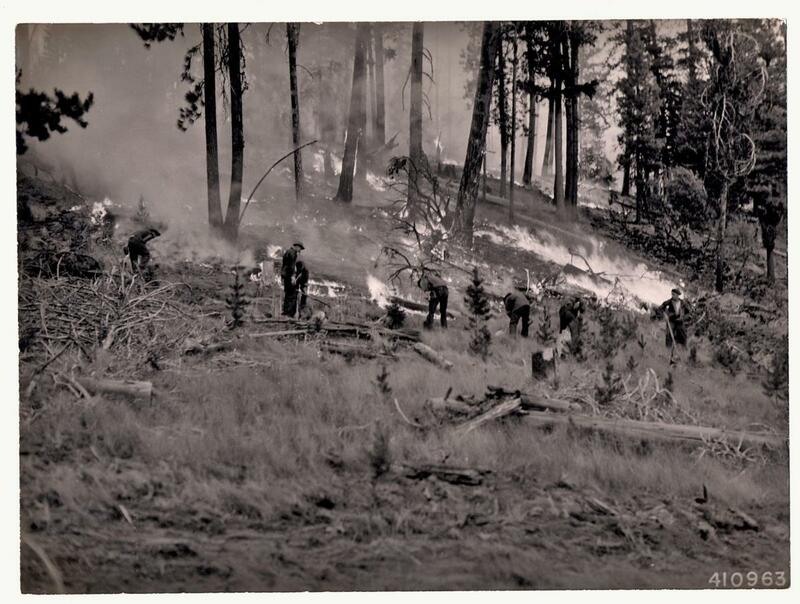 149, a Forest Service project conducted from several locations opened in June 1945. Operated by the American Friends Service Committee, the Brethren Service Committee, and the Selective Service System, the project closed in June 1946. 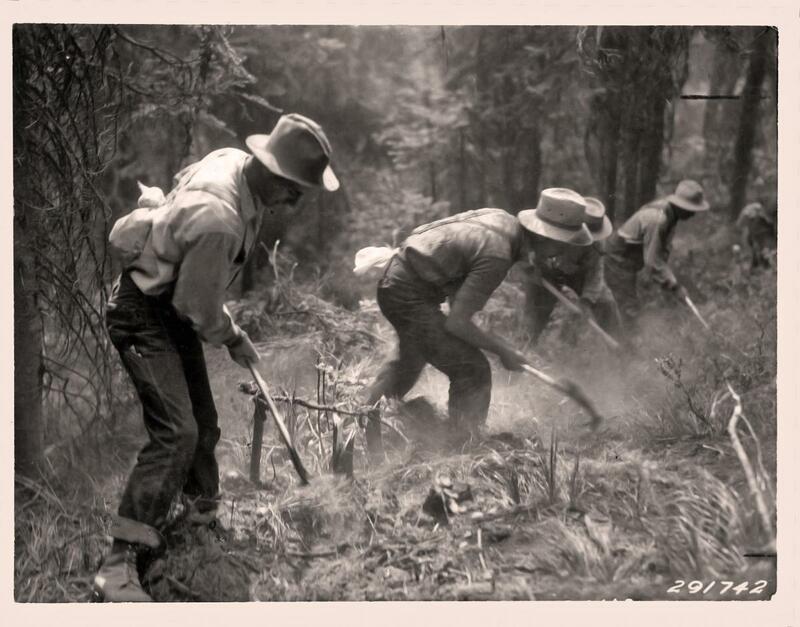 Men worked on Forest Research Projects located in several states. 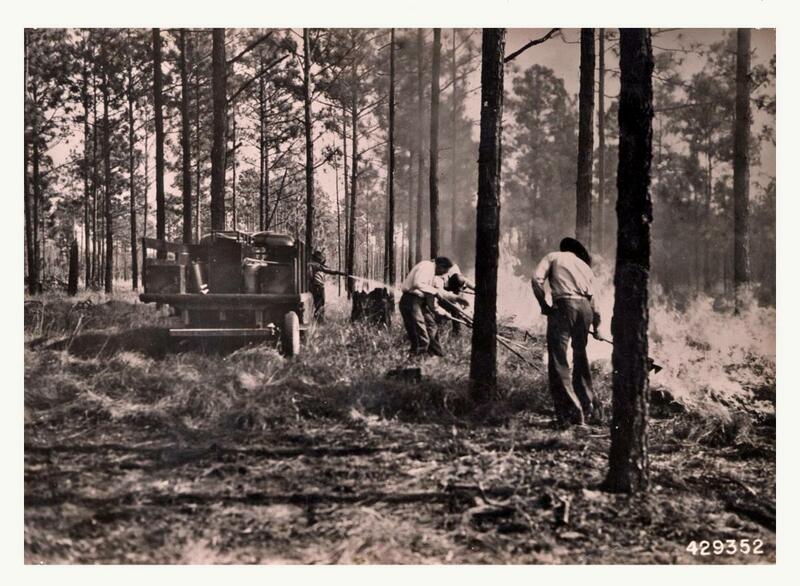 Men in this unit worked at Forest Research Projects located in Bent Creek Experimental Forest in Asheville, North Carolina; Hopkins Memorial Forest Project in Williamstown, Massachusetts; Olustee Forest Experiment Station in Lake City, Florida among other locations. The unit, approved for nineteen men, consisted of men who transferred from Big Flats, New York CPS Camp No. 46. While most of the men performed statistical tabulation, computation and analysis for various research projects, some did drafting, photo-analysis, and map-making. Camp Order No. 149 of Lewis B. Hershey, June 4, 1945 in the Swarthmore College Peace Collection, American Friends Service Committee: Civilian Public Service Records (DG002), Section 1, Box 36e. Mss. Report on U.S. Forest Service Research Project [Various Locations] Camp/Unit No. 149, Aug. 7. 1945 in the Swarthmore College Peace Collection American Friends Service Committee: Civilian Public Service Records (DG002) Section 1, Box 36e.